We have no idea why this bar is called Yoga Bar, but it was the name that first caught our attention and we’re so glad it did. Yoga Bars are raw, organic, fair trade, vegan…and delicious! They are made with only five ingredients: Organic Raw Dates, Organic Raw Cashews, Organic Raw Cacao Butter, Organic Raw Pistachios, and Organic Raw Honey. 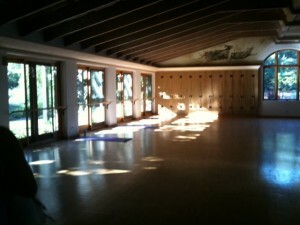 Yoga Bar was chosen as the Best Raw Food Bar by NaturalNews.com with good reason. The cocoa butter makes these bars taste like white chocolate and they simply melt in your mouth. It’s a small snack that is surprisingly satisfying. Yoga Bars are the perfect bite before or after yoga, since they feed your hunger (and your sweet tooth) without filling you up or weighing you down. We also offer Indigo Nights, which is a raw, organic, vegan fudge bar by the same company that makes Yoga Bar. The next time you’re in the studio, pick one up (or two, or three…) and taste how delicious “healthy” can be. 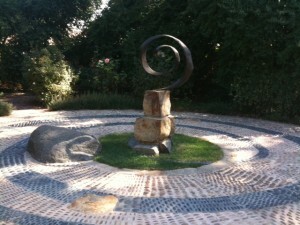 Evolved from the spiral forms of nature, labyrinths have been known to the human race for over four thousand years. The Cretan labyrinth, Hopi medicine wheel, Jewish Kabbala (Tree of Life) and Tibetan sand paintings… all share the labyrinth motif and theme of transformation… either through meditation or a participant’s actual walk along the path. Not a maze—which confuses the participant with game-like devices such as cul-de-sacs, false leads, high walls, and other elements of challenge—the labyrinth seeks to quiet our mind and lead us to peace and inner knowing. 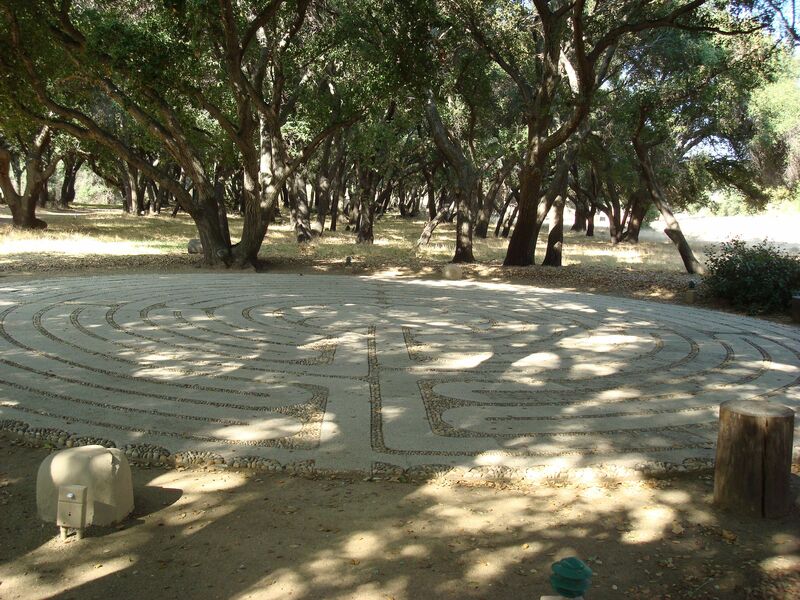 Rancho La Puerta’s labyrinth is an archetypal and non-denominational mind/body/spirit experience, and is a replica of the famous floor labyrinth laid in Chartres Cathedral sometime between 1194 and 1220. The path is a classical eleven-circuit design, a metaphor for our journey through life. One path takes you to the center and back out again, leading you through many turns. The six-petaled center is known as the rosette. In some traditions, each petal of the central rosette symbolizes one of the six stages of planetary evolution. Standing in the center, the first to the left is mineral, the second (moving clockwise) is vegetable, then animal, human, angelic and divine. Ten labyrs—the hourglass—are symbols of women’s creativity and power. Each two-thirds circle along the outer edge is a lunation that tracks moon cycles and may have been a way of determining religious feasts in the Middle Ages. 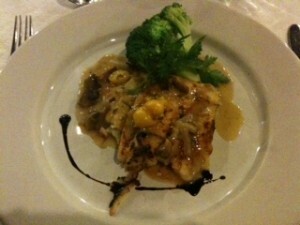 Your guide to the experience will further explain may of these fascinating references. May you find all you seek on your journey. 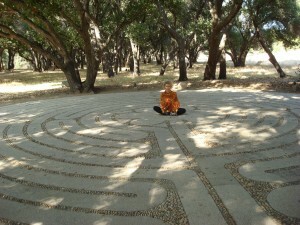 Before you begin to walk our labyrinth… pause and take a deep breath. Allow yourself to focus and slow down. Find your own pace. You may pass people or allow them to walk around you. The path is two-way. If you are going in and another person is going out, you will meet on the path. Do what feels natural. As you walk, you may either choose to let all thought go and open yourself to the experience, or you may consider a question as you walk. 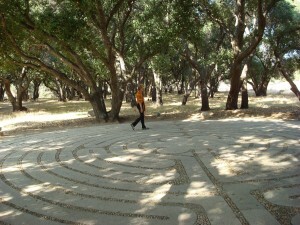 The walk into the labyrinth is a time of releasing and letting go of the details of your life. The center is a place of meditation and receiving what is there for you to receive. As you leave the center and retrace the path that brought you in, focus on integrating the insights you have received. 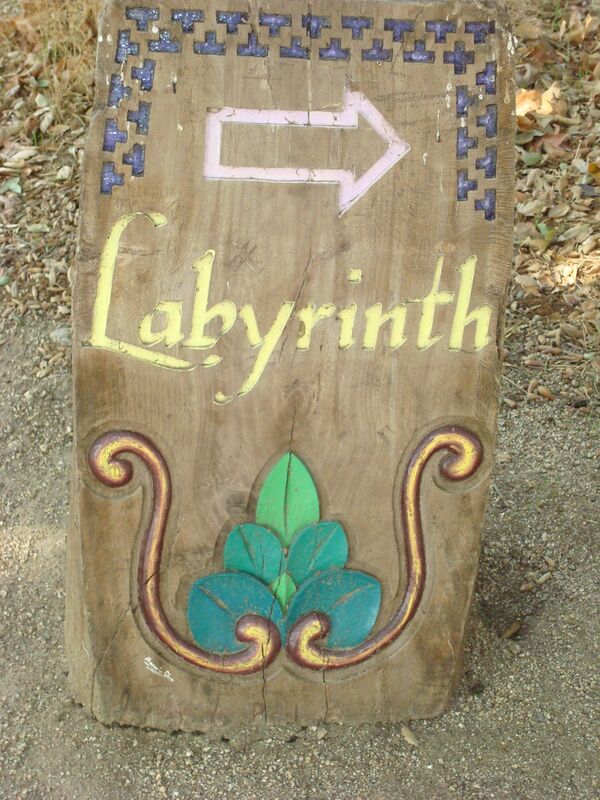 Each experience in the labyrinth is different. 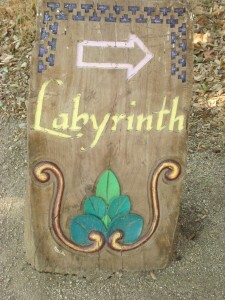 The best way to learn about the labyrinth is to walk it a few times with an open heart and open mind. You don’t need a labyrinth to create this experience for yourself. 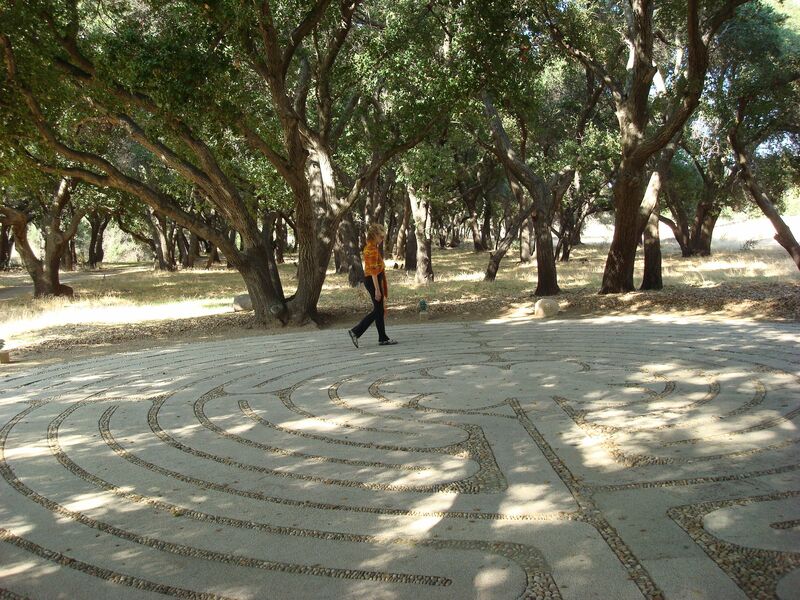 Simply walking in a spiral pattern or along a well-known path can allow you to free your mind of worries and chatter. Questions may be answered and insights gained. At the very least, you will leave the experience with a feeling of peace. Try it for yourself. Lao-Tzu’s Tao Te Ching, or Book of the Way, is the classic manual on the art of living and one of the wonders of the world. In eighty-one brief chapters, the Tao Te Ching looks at the basic predicament of being alive and gives advice that imparts balance and perspective, a serene and generous spirit. This book is about wisdom in action. It teaches how to work for the good with the effortless skill that comes from being in accord with the Tao (the basic principle of the universe) and applies equally to good government and sexual love, to child rearing, business, and ecology. The Tao Te Ching is the most widely translated book in world literature, after the Bible. Yet the gemlike lucidity of the original has eluded most previous translations, and they have obscured some of its central ideas. 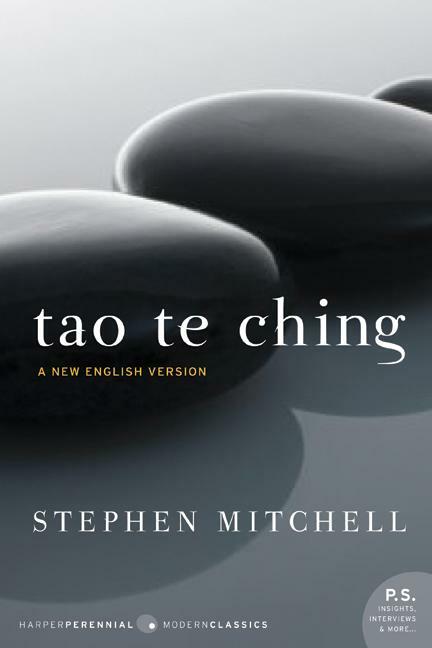 Now the Tao Te Ching has been rendered into English by the eminent scholar and translator Stephen Mitchell. Pick up a copy at Amazon, Barnes & Noble, or your favorite retailer and join the discussion. Happy reading! One of our favorite things at the studio is Miracle II “Miracle” Soap. People might wonder why we sell soap in a yoga studio, but most people (hopefully!) use soap every day, so it is an important part of our lives that is linked to our wellbeing. Studies show that much of what we put on our bodies finds its way into our bloodstreams, so we want to use products that are as natural as possible and of a high vibration. Miracle II Soap is unique in many ways, from its vibrant green color (derived from sea plants) to its rich, creamy lather, but the story behind its creation is what usually grabs people’s attention. The soap was created in 1980 by a man named Clayton Tedeton, who claims he received the formula through Divine revelation. He gave the soap away for 5 years before starting to bottle and sell it. Over the years, many people have claimed that the soap has healed a variety of skin and scalp issues. Whether or not these claims can be substantiated, the product simply makes a wonderful body soap, shampoo, laundry detergent, and dish soap, along with a myriad of other uses. Each bottle of Miracle II Soap has been prayed over (the first ingredient listed is “Prayer”), and we at the studio know the power of intention and subtle energy to raise vibration, so we feel that this is the perfect product to offer to our students and clients. Grab a bottle the next time you’re at the studio and experience the Miracle for yourself. OK, I said I’d talk about the food at Rancho La Puerta, so I’ll concentrate on tonight’s “Fresh from the Garden and Sea” dinner menu. The menu states that the meals are calorie-controlled spa portions, but as you can see from the pictures, nobody is starving here. 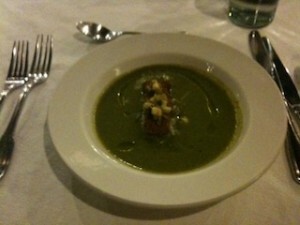 We began our meal with a bowl of Sautéed Asparagus Soup with Garlic Crouton. I have always been a huge fan of soup, and this first course did not disappoint. 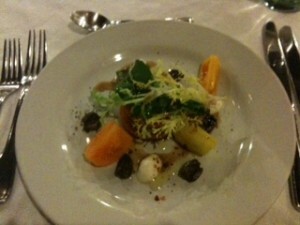 The soup was followed by a Tomato, Mozzarella and Basil Salad with Sautéed Olives in a Purple Basil Vinaigrette. The simplicity of this classic salad allowed the flavors of the fresh herbs and tomatoes to shine through. 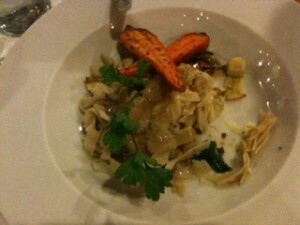 For the main course, my husband chose the Provençal Tilapia with Rustic Mashed Potatoes and Steamed Broccoli in a Wild Mushroom Sauce, while I opted for the Homemade Fettuccine on Sautéed Spinach with Roasted Carrots and Puttanesca Sauce. As evidenced by the picture to the right, I was unable to keep myself from taking a bite before snapping a photo. 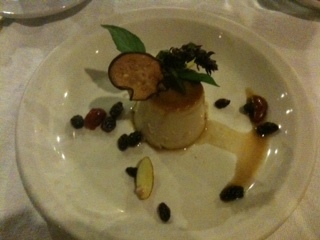 All of this bounty was topped off by a delicate Neapolitan Flan for dessert, artfully presented with dried fruit and a sprig of herbs. If this is health food, sign me up! My first Prime of Life Yoga class was packed with forty people. We meet in the Montana Room, which is huge with an oak floor, high ceiling, and two walls of gorgeous glass doors that lead out to lush gardens. The main wall has a giant arched window that lets the sun shine in, and there is a very large walk-in prop room fully equipped with everything one could possibly need. The class flowed easily with lots of fun, love, and acceptance. Folks were very generous with their comments and support, so I am excited to continue the journey today. I teach every day at 11:00 am for 75 minutes, and then Monday, Wednesday, and Friday at 4:00 pm for a Restorative Class. I feel tremendously blessed to find myself in heaven with the added bonus of being allowed to share the gift of yoga while I am here. I am deeply humbled and in awe of my incredible blessings. Life is beautiful! Shine on!!! Saturday, Oct 15, 2011	¡Buenos días from México! 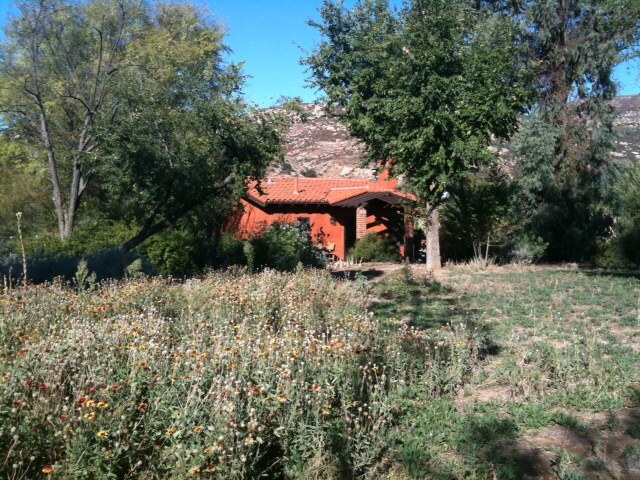 As some of you may know, I am teaching yoga for a week at Rancho La Puerta in Mexico, which was voted World’s Best Destination Spa in both 2010 and 2011 by the readers of Travel + Leisure magazine. My husband decided to accompany me and make it a special getaway for the two of us. 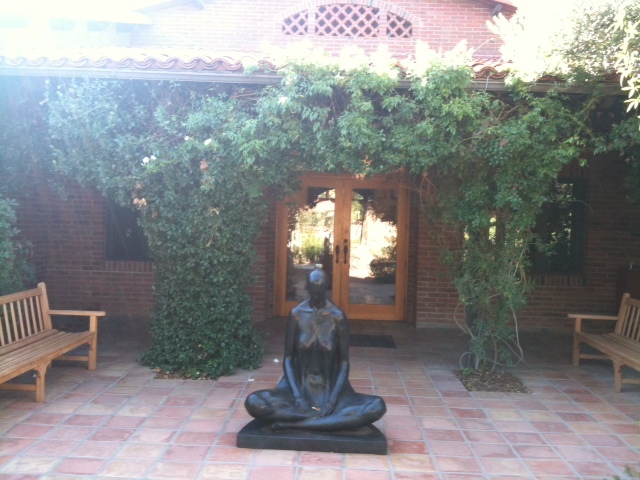 Our arrival at the iron gates of Rancho La Puerta opened to an entire world of elegant beauty and peace. 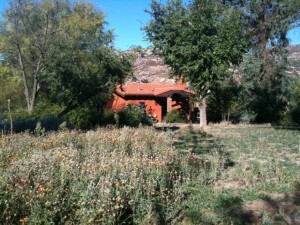 The architecture, art, and landscaping offer a broad tapestry of texture, color, and fragrance that is unforgettable. The colors that meet your eyes are bright, vital, and dazzling in the sunshine placed against a backdrop of high desert rolling hills and a huge canopy of azure sky. 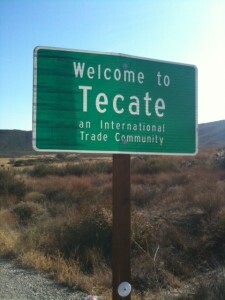 We were escorted to our own personal casita (house) for our week’s stay. Much to our delight, we discovered that our slice of heaven was tucked into a private knoll surrounded by natural landscaping that we share with countless birds, rabbits and ground squirrel. 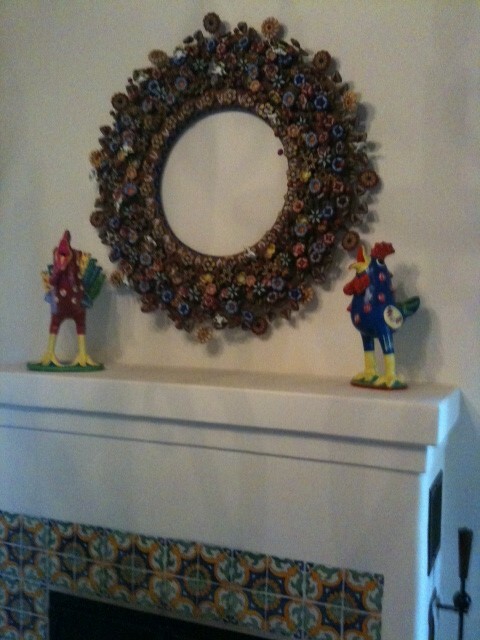 The inside of our casita is appointed with numerous tapestries all in bright Mexican colors complemented with embroidered pillows, a huge wreath above our stone fireplace sculpted out of pottery, and two papier-mâché roosters standing guard—crowing—on our mantle. (This is a great omen for me as my maiden name, Hahn, means rooster!) We have a large step-down bedroom filled with natural light and more extraordinary artwork placed perfectly to nurture your soul. 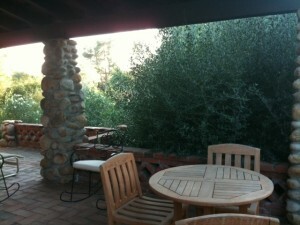 Actually…I am beginning to believe that this is exactly what Rancho La Puerta is all about—soul soothing! We arrived at dusk and, after settling in our room, it was time for a ten-minute stroll to the massive dining hall where we were in for the most extraordinary eating experience. Greeted by staff, we were seated at a table for six where we met three women from different parts of the country, all of whom had arrived for “soul soothing”. 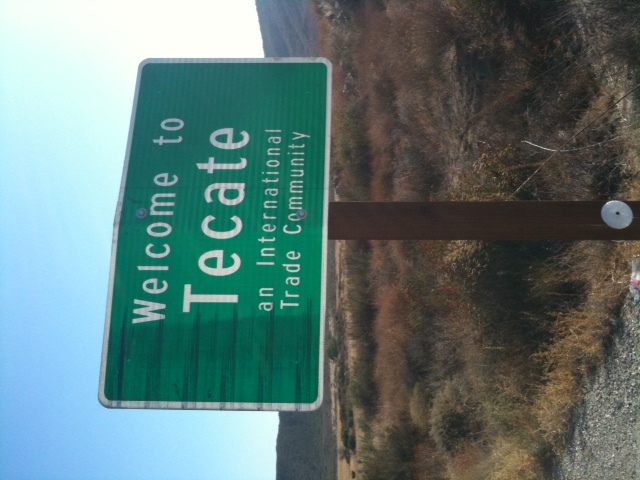 We discovered that part of the charm of the Rancho is encouraging folks to meet one another. At a later date, I shall go into detail about the food experience, as it deserves complete, undivided attention! We love to share our favorite books, CDs, DVDs, health tips, and products with our students and clients. 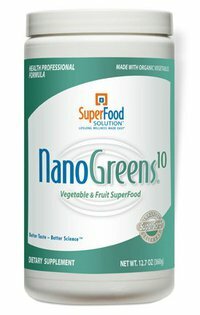 Today we want to give you some information about one of Marydale’s favorite nutritional supplements: NanoGreens10. This is a vegetable and fruit “superfood” powder that you mix with water or juice. Marydale starts every day with NanoGreens and can’t image a day without it. She has tried other, similar powdered supplements, but none of them tastes as good or makes her feel as energized as NanoGreens. Each glass of this superfood powder contains 10 servings of fruits and vegetables from the most colorful and phytonutrient-rich plants available. That’s more than double the recommended daily allowance (RDA) of 3-5 servings per day. In addition, NanoGreens has a patented SuperSorb™ Delivery System that breaks the food down into micro, nano-sized particles to help your body absorb and use the nutrients instantly. Whether you drink NanoGreens to start your day, before or after a workout, or as a late afternoon pick-me-up, you will get a burst of energy without any of the negative effects of coffee or other sugar-laden, caffeinated energy drinks. On the contrary, you will feel good about knowing that you are feeding all of the cells of your body with high-quality nutrition. At Param Yoga, we sell the NanoGreens10 12.7 oz. canister, which lasts a month if used daily, and the single serving packets for some post-yoga nutrition or an energy boost on-the-go. Next time you’re at the studio, make an investment in your health with NanoGreens.